Tom McBride of Swarthmore takes his turn in the fireplace. Bob Small of Swarthmore organized the event. Some are preparing to speak. Some are preparing to listen. 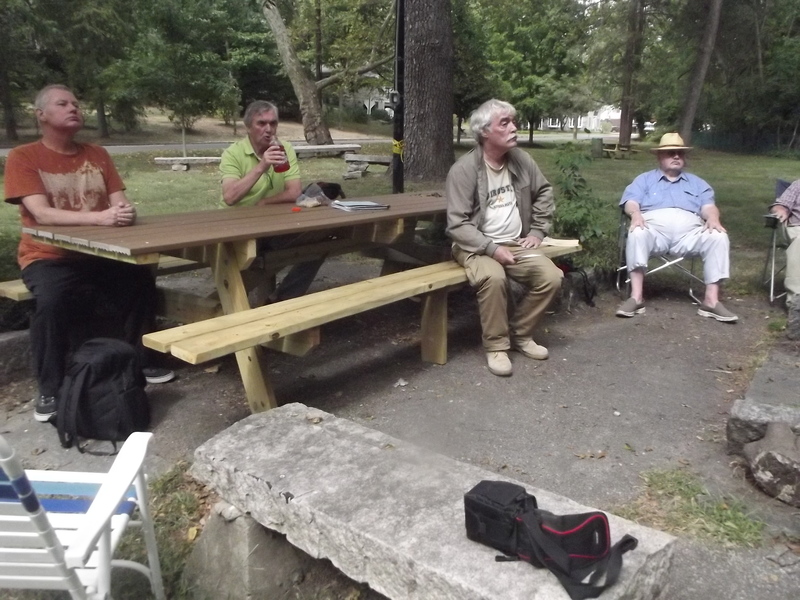 DelcoDebates Swarthmore Speakers Corner A Success — DelcoDebates presented its initial Hyde Park Speakers Corner event, Saturday afternoon Sept. 17 in Swarthmore, in Little Crum Creek Park on Cresson Lane, just off Swarthmore Avenue. The free event was held in a shady grove in the park by the large stone fireplace. Volunteer speakers included Roger Balson, Bill Denison, Rich Gardner, Ed Mcadams, Tom McBride, Wil Scull and Bob Small. Bob Small gave a short introduction followed by Roger Balson explaining the parameters of the discussion. About a dozen short talks were given on a range of topics, including 911 as discussed in Europhysicsnews.org; the need for activism; Smedley Butler; constitutional amendments; environmental degradation; free and equal elections; gerrymandering, and quick and easy questions to ask local and national candidates. Afterward, future activities were discussed including referendum on the November ballot concerning an amendment to the Pennsylvania Constitution which would increase the mandatory retirement age for judges from 70 to 75. Those who would like to be notified of future Candidate Forums, Issue Forums, Speaker Corners can contact Delco Debates at delcodebates@gmail.com. The Speakers Corner in London’s Hyde Park began in 1872 and continues to this day. Many other countries have since created a Speakers Corner, where anyone can speak. including alternative and Independent Candidates.